Cataract surgery is all about removing the faulty lens in your eye, and in majority of the scenarios, replacing it with an artificial lens. In fact, it is among one of the most frequently and successfully carried out eye surgeries right now, in the U.S as well as across the globe. According to the American Society of Cataracts and Refractive Surgery (ASCRS), 3 million Americans undergo cataract surgery each year, with an overall success rate of 98 percent or higher. 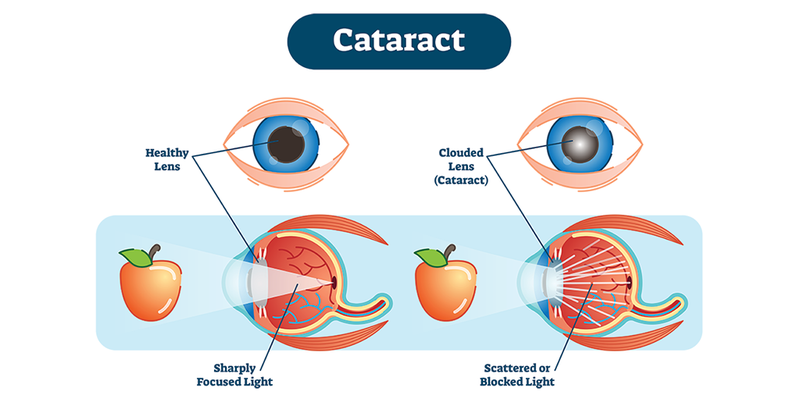 Cataract is an eye condition leading to the cloudiness of a clear eye lens otherwise, which results in affecting your vision eventually. An ophthalmologist normally carries out a cataract operation, and in most of the cases, you don’t even need to stay in the hospital after the surgery is done, i.e. you get it done on outpatient basis. So, why do you need a cataract surgery in the first place? Well, if you want to get your cataracts problem treated, you need to undergo such a surgery. Since cataracts can inflict you with a blurry vision, also turning your eyesight sensitive to the glare from lights, turning your daily-life activities into a problem for you. This is when your doctor may advise you for cataract surgery. Another possible scenario leading you to such a surgery can be the interference or hindrance of cataracts in treatment of other eye problems, such as age related macular degeneration, diabetic eye problems and other common eye diseases. With a clouded eye lens, optometrists fail to examine the back of the eye comprehensively. When is the right time to have cataract surgery? Are cataracts making it difficult for you to carry out your daily or occupational activities? Is your ability to drive to work or at night being affected by cataracts? Is reading or watching television becoming cumbersome for you due to cataracts? Are you having issues in cooking, shopping, yard-work, taking medications or climbing stairs? Do you feel difficulty in seeing under bright lights? Is your level of independence getting disturbed after having cataracts? Is your cataracts problem manageable through alternative ways? Also known as ‘Phaco’, it is the most common technique used for cataract removal nowadays. Usually, it takes no more than half an hour to remove cataract through phacoemulsification, and that too, requiring only minimal sedation, i.e. local anesthesia (injecting anesthesia around the eye) or topical anesthesia (administering numbing drops into the eye). This cataract procedure requires a small surgical incision around the edge of the cornea, creating an opening through the membrane surrounding the lens. The next step involves inserting a small ultrasonic probe into the opening to break up the cloudy lens into tiny fragments using sound waves, which act as a microscopic jack hammer. An attachment on the probe tip is then used for suction of broken down cataract fragments. 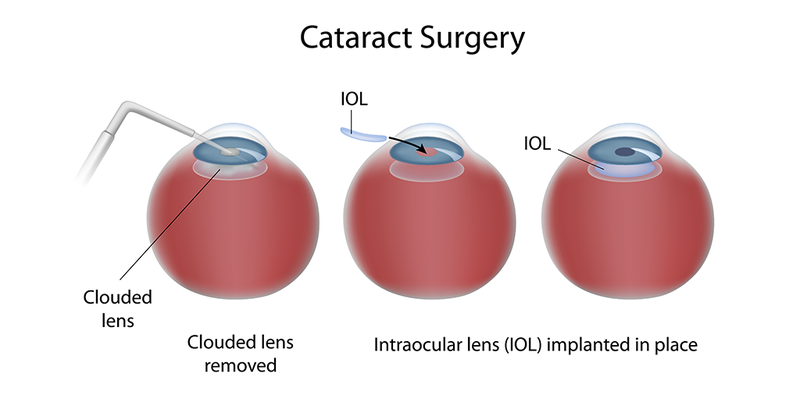 Once the lens particles are removed, an intraocular lens implant, also referred commonly as an IOL, is implanted in the natural lens capsule. A hollowed out tube is used by the ophthalmologists to insert the IOL through a tiny corneal incision. This is the cataract procedure used in case of highly advanced cataracts, which is too dense for phacoemulsification (the process of breaking down or dissolving the cataract into tiny fragments) or when phacoemulsification is not possible for various other reasons. A slightly larger incision is required for this cataract removing technique, so that the cataract can be removed in one piece instead of being fragmented within the eye. Just like phacoemulsification, an artificial lens (IOL) is placed inside the same capsular bag. A number of sutures are required to close the comparatively larger wound, which also results in slower recovery of the wound as well as visual function. To initiate this cataract removal technique, the numbing medication is administered through an injection around the eye. An eye patch is also required after this kind of surgical process. Though rarely used nowadays, this cataract removal technique may still be useful under certain circumstances. It requires an even larger incision as compared to extracapsular surgery, through which the entire lens with surrounding capsule is removed. Moreover, the IOL (intraocular lens) is placed in a different location, in front of the iris, in this surgical procedure. Though more than 98% success rate of cataract surgery makes potential cataract surgery complications a rare incidence, the possibility of certain problems is still there; for example, bleeding or infection (endophthalmitis). Since every single person with cataract can have varied health conditions, your ophthalmologist is supposed to discuss the specific potential complications of the type of cataract procedure most feasible for you, requiring your signatures on a consent form. Cataract surgery recovery is also one of the most concerned aspects of cataract removal, especially the time required in restoration of functional vision after the procedure. You’re expected to take first follow-up visit to your ophthalmologist within the first few days after the cataract surgery, followed by a subsequent visit within the first few weeks. In most of the cases, you’re prescribed with specific types of eye drops to reduce inflammation and protect against infection. Most people observe an improvement in their visual function within several days of the surgery, enabling them to restart most of their daily activities including work. However, you need to have several visits to the doctor, who monitors and observe your eye(s) for any signs of complications. Majority of people regain full activity after a few days of getting treated. Your doctor might fit you with a pair of glasses (if needed) once your vision is stabilized. This also depends upon the type of intraocular lens implanted in your eye. There is also a possibility that you are unable to get cataract surgery, due to old age, for example. If so, you may consult your doctor for resorting to some of the contemporary low vision aids like IrisVision, which are designed to augment your visual capacity, returning you some of the independence that you once enjoyed before falling victim to this eye disease.